Please e-mail us at sales@theultimategreenstore.com if you are interested in buying this product in bulk. 92 GE brightness rating. 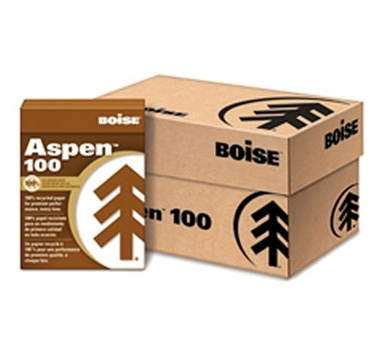 20-lb., white, acid-free paper made without the use of chlorine or chlorine compounds. (PCF). Offers the same hardworking characteristics and brightness as a non-recycled sheet. 8-1/2 x 11. Recycled, 100% post-consumer content. 500 sheets per ream. Ten reams per carton. The Ultimate Green Store has partnered with The Green Office to bring you a wide array of eco-friendly office products. All purchases made for products brought to you by this partnership will take place through The Green Office.com’s website. Click “Add to Cart” to proceed to The Green Office.com.